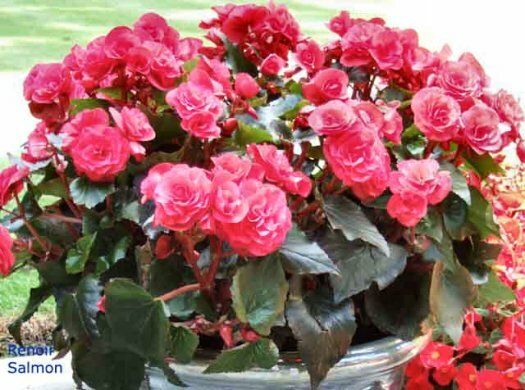 With the renewed interest in begonias for containers, baskets and garden use it is good to see that the introduction of new tuberous begonias will continue in 2009. 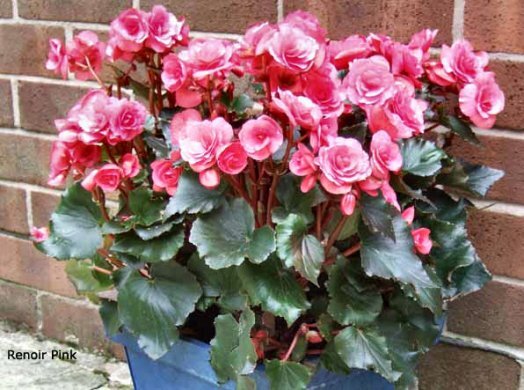 The dull wet summer of 2008 proved how useful tuberous Begonias are in the garden, as many of the traditional summer plants performed poorly under these conditions. On the other hand, Begonias continued with their wonderful colourful display until the season’s end. 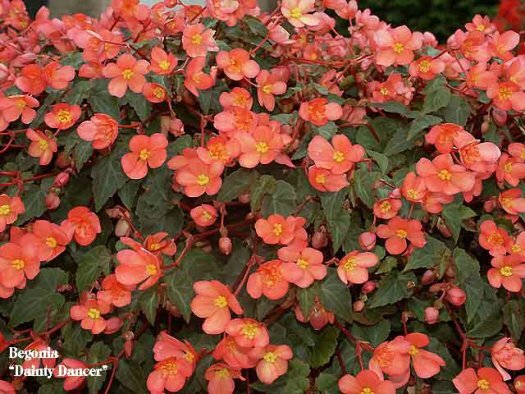 I have been trying for many years to raise the awareness of the advantages of tuberous begonias for outdoor summer use; it pleases me that so many different new types are becoming available. 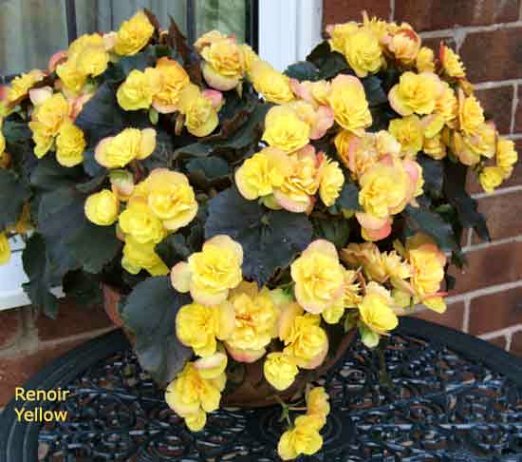 The “Renoir” Begonias are a development from the Reiger type begonias and were bred in Germany specifically for patio containers as they are upright in habit; they flower profusely in many positions including bright sunshine. They make good strong plants and are almost foolproof in the garden with strong dark bronze green leaves. Presently available in four individual bright colours, flowers are of medium size and fully double with very strong and hard petals, again useful to dispel the rain. 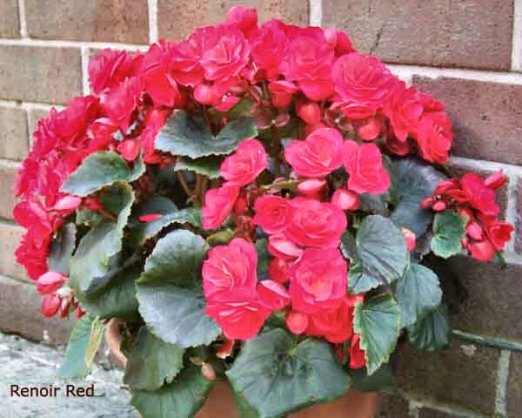 The “Renoir Red” is one of the best true reds available in Begonias of this type, a brilliant colour; the “Renoir Salmon” as a combination of plant and flower is almost perfect, the “Renoir Pink” is a gorgeous rose pink and the “Renoir Yellow” is bright and striking. The family work well together being uniform in plant and flower, making them ideal for large displays in containers, they will brighten up patio’s and other areas of the garden. Flowering continually all summer long, they would also be good bedded out if we had a dry warm summer but having had a couple of wet summers in the past few years, it is a safer bet using them for container’s. 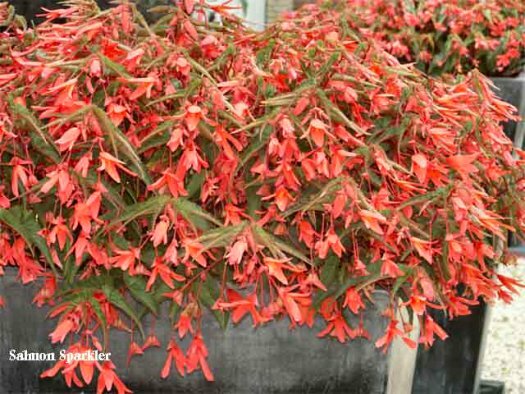 They have been developed using Begonia: socratana in their breeding, so they prefer drier conditions than the tuberous multifloras. 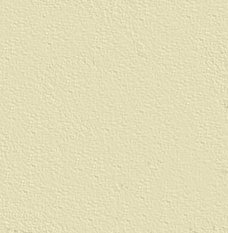 The 4 colours can be seen in the pictures and are available in many garden centers. To find a stockist near you, visit www.brilliantgardens.com where they have a list of garden centers they supply around the country. My variety “Peardrop” had a limited introduction last year but with the build up of stock they will be more widely available in 2009. With this variety you get two for one when it comes to the flower shape and colour. 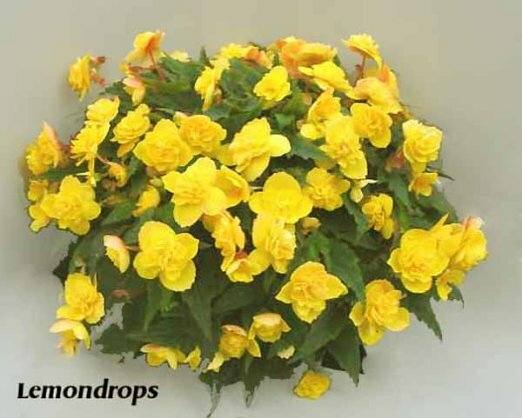 In cooler conditions it is a double salmon pink but with warmer weather the yellow center develops which makes this a unique begonia as can be seen in the picture. Small to medium sized flowers with beautiful dark veined foliage, a well grown plant is a delight, especially when the yellow center is fully developed. I would classify this as a multiflora, as the plant height is similar to “Le Flamboyant”, stockists can be found at the web address previously mentioned. It is also useful for containers, especially in warmer conditions where the yellow center is likely to develop earlier than when bedded out. Window boxes would also suit this variety where it would show off both its attractive foliage and bi-coloured flowers. “Ami Jean Bard” was introduced a century ago in 1909 bred by Arthur Billard in France; tubers of this variety were produced before and just after the last war in their hundreds of thousands. Although like so many multiflora varieties it virtually died out from commercial production, however, 2009 will see plant production once more, although production will be limited until commercial stock is built up. Will possibly be available in some garden centers, the variety “Madame Richard Galle” was a sport from this about 1932 in Belgium. I was fortunate to discover a yellow sport from this group in 2006; it is very similar to “Frau Helene Harms”, coming from “Madame Richard Galle” it has the same flower size and habit. The main difference to “Frau Helene Harms” is shorter pedicles making this a more compact plant, although when planted in full sun the guard petals develop a salmon colour on the reverse of the petals, not as deep a colour as the guard petals on “Frau Helene Harms”. Habit is the same as “Ami Jean Bard” and “Madame Richard Galle”; this has been named “Lemondrops”, which means the 3 colours can be used to make some very even plantings almost carpet bedding. Availability will be limited this year but should improve next season as stock is built up. The following 5 varieties have come from the breeder of the Million Kisses series, Fred Yates and bred in Cheshire, they will be available in many garden centers round the UK. 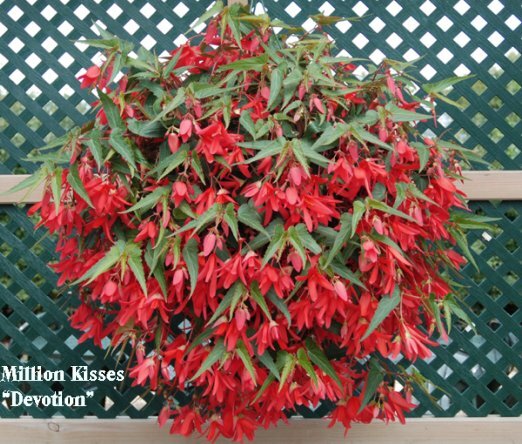 Another colour in the “Million Kisses” single series will be available this year, a nice bright almost velvety red named “Devotion”, a stronger grower than the original orange / scarlet Million Kisses “Passion” which will no doubt be as popular as white “Elegance”, and pink “Romance”. The flowers are about a third larger than the other varieties in this series with the same habit of growth but stronger, so will make excellent container and basket plants. The second one I saw at a trade display in the summer, grown as a basket it was covered in small anemone type flowers although it could be used for containers and possibly garden planting. Displayed in any of the NBS shows as a basket plant it would create a great deal of interest. 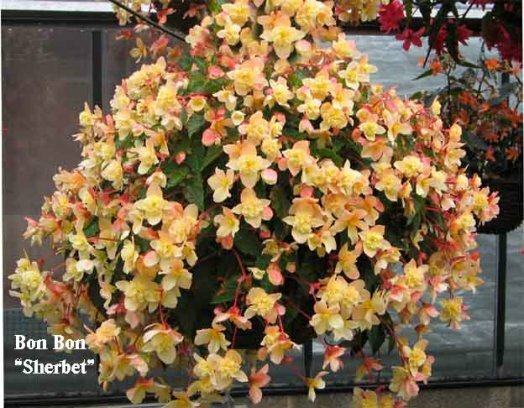 It has an unusual name “Bon Bon Sherbet”, it is something different from the recognized begonia shape but its flowering capabilities look excellent and it should prove very popular. Not sure how many plants were in the basket shown in the picture, but you must agree they make a beautiful display. Although the next 3 varieties will be propagated in the Netherlands they are likely to turn up at a number of Garden Centers, as did the original “Salmon Sparkler” last season. 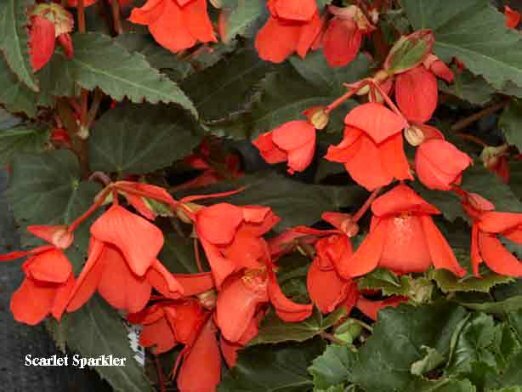 A new colour “Scarlet Sparkler”, with similar flowers and foliage to the Million Kisses series is to be introduced this year, with more upright growth being suitable for both garden and container use. 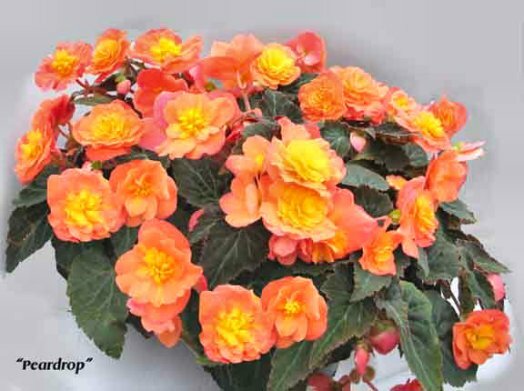 Something totally different in the tuberous begonias is “Dainty Dancer”, with tiny ½inch single salmon orange flowers with a plant height of 3 inches and trailing 18 inches when planted in a basket or container. 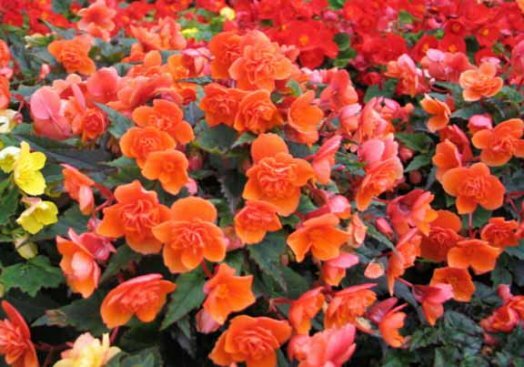 Looking at the picture of this variety it could even be suitable for bedding; it certainly is worth trying this way as it could make a good edging plant to beds of multifloras and other Begonias. No doubt there will be others available from other sources; the ones mentioned are varieties I know about. There are many others in the pipe line for future introductions, so at last cutting raised begonias for the garden with their reliability are taking their rightful place as long flowering colourful garden plants.